Located in central Colorado where the foothills of the Rocky Mountains meet the Great Plains, the city of Boulder is a great destination year-round for outdoor adventures. However, one of the best things about living in or visiting this thriving city is the multitude of hiking options within 10 minutes of Boulder. Even though the snowfall and freezing temperatures of the winter months may make hiking a bit more difficult than the short summer hikes in the city, offseason hiking in Boulder can be just as rewarding. Plus, Colorado’s winters are generally mild, so you can often find hiking areas with limited or no snow, especially at lower elevations. 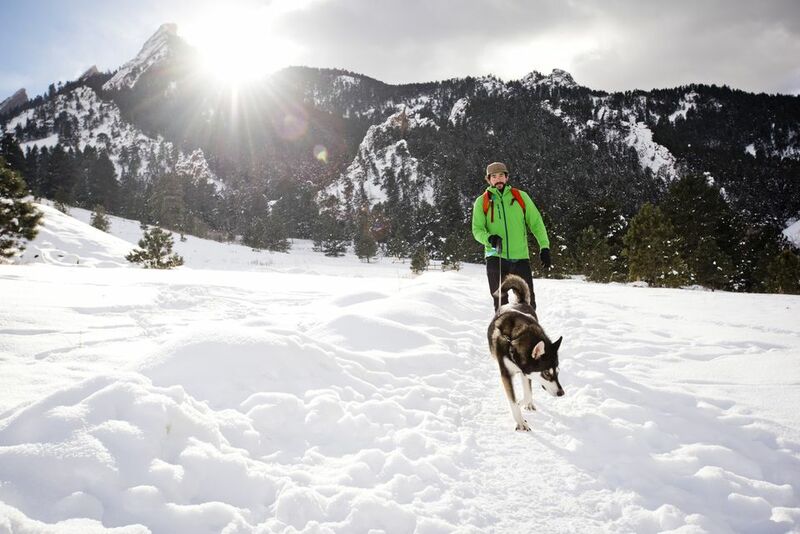 These top five trails within the Boulder area offer the easiest and best hikes you can take, even in the winter, and as an added bonus, trails are considerably less crowded, ​which can make for an even better hiking experience. The Flatirons are the defining geological feature of Boulder's skyline, rising up northwestward to the Rocky Mountains, and the Flatiron Number One trail takes you on a relatively quick trip to the top. Although the hike can become fairly strenuous near the top of the ridge, the two-mile journey ​should take about two hours to complete. Ample sunlight means that the snow is minimal, even in the coldest months of winter, and the views from the top of downtown Boulder and the Front Range are unmatched. Getting There: From downtown Boulder, you can take Broadway (Highway 93) to Baseline Road and turn by Chautauqua Park onto Kinnikinic Road. You can park at the Chautauqua Ranger Cottage and head toward the Bluebell-Baird Trail junction. Once there, bear left, then immediately head right, following the signs for Flatiron #1. Another great hike you can take in the winter from the Chautauqua Trailhead is a trip to the Royal Arch. Just a mile and a half up the Bluebell Mesa Trail (starting at the Chautauqua Ranger Cottage), this giant sandstone arch also features great views of the plains below. A trip to and back from the Royal Arch takes about two hours any time of year, but some parts of the trail may be slippery and slushy in the winter, adding more time to your hike. Still, the trail is relatively easy to navigate despite gaining 1,400 feet in elevation, even in the winter. Getting There: Unlike the Flatiron Trails, which split off from the rest of the trails earlier, the Royal Arch is just a noteworthy stop on the Bluebell Mesa Trail, so you'll have to follow marked signs to make sure you find it. You can then take a marked loop back to the Chautauqua Ranger Cottage to complete the hike. Just outside Boulder, Eldorado Canyon is a quiet, easily accessible treasure with plentiful options for winter hiking and rock climbing. The multiple trails range from easy to difficult, with great views of the continental divide awaiting those that climb to higher altitudes. You can expect to have the trails mostly to yourself during the winter months. Even though the area does experience light to moderate snowfall most of the winter, the Bastille Trail and Fowler Trail are both relatively easy even in the snow. Getting There: From downtown Boulder, take Broadway (Highway 93) south about 5 miles out of town. When you come to the stoplight at Highway 170 (Eldorado Springs Drive), take a right and follow the road through Eldorado Springs. You'll eventually arrive at the state park entrance and can follow signs for parking and trailheads. Just a few minutes outside of Boulder, Betasso Preserve sits between Sugarloaf and Four Mile Canyons, offering stunning views of both from peaks along the many trails found here. The Benjamin Loop is a wide, well-maintained 2.4-mile trail that is suitable for casual hikes or mountain biking. There are also plenty of other trails including the difficult Batasso Link (1.3 miles), the moderate Canyon Loop (3.3 miles), and the Blanchard Trail to the Blanchard Cabin. Getting There: From Boulder, you can take Highway 119 (Canyon Road) west for 6 miles before taking a right on Sugarloaf Road. Follow Sugarloaf for about a mile, then take a right on Betasso Road, which leads directly to the preserve and trailhead. Although this popular hiking spot is commonly confused with Red Rocks Park and Amphitheater in Morrison, which is closer to Denver, Settler's Park is close to downtown Boulder and has trails for all levels of hikers. Red Rocks Trail has several routes, but the most popular one for novice hikers is about a half-mile long and begins at Settler's Park Trailhead. In under an hour, you can walk most of the trail, which peaks at about 300 feet, offering a spectacular view of the city. Getting There: From Boulder, you can take Boulder Canyon Drive west for less than a mile before turning right onto Pearl Street, which is essentially at Settler's Park. There's a parking lot and plenty of street parking down Pearl Street, but you shouldn't expect too many hikers in the winter.